The IMI-group has a high multidisciplinary nature and consists of enthusiastic scientists with a background in biology, medicine, chemistry, nanotechnology, engineering and/or physics. Jointly we pursue the development of imaging agents and imaging technologies that can be applied during surgical and/or radiological interventions (image-guided surgery), ultimately aiming to improve outcome and reduce side effects. Here, we strongly focus on a multimodal/hybrid guidance concept whereby pre- and intra-operative imaging information is integrated to provide optimal sensitivity and specificity. By exploiting the different backgrounds present within the group, we approach (clinical) challenges from multiple angles. When combined, this multidisciplinary approach can drive a rapid clinical translation of new technologies that could benefit patient care. Since its development (2007) and clinical introduction (2009), the hybrid tracer ICG-99mTc-nanocolloid has revolutionized the way sentinel node resection are performed. (Inter-)national studies that cover a great variety of sentinel node indications (e.g. (head-and-neck) melanoma) have underlined the value of using these multimodal nanoparticles for surgical guidance (>50 papers). In particular their ability to integrate pre- and intra-operative imaging findings can be considered highly advantageous. While ICG-99mTc-nanocolloid is a sentinel node specific tracer that can be detected using nuclear medicine modalities and (near-infrared) fluorescence imaging, the hybrid concept can easily be expanded to (tumor) receptor-targeted tracers. Studies using ICG-99mTc-nanocolloid also provided the basis for many industrial collaborations and both hard- and soft-ware developments. Schematic overview of the hybrid approach for sentinel node biopsy. Hybrid ICG-99mTc-nanocolloid is intradermally injected in four deposits (total volume 0.4mL) surrouding the (melanoma) (A). Immediately after tracer injection, dynamic lymphoscintigraphy is performed followed by static images at fifteen minutes and two hours post-injection. Thereafter a SPECT/CT scan is acquired (B). Prior to the start of the operation, a volume of approximately 1.0mL patent blue dye is injected after which the injection site is massaged (C). Intraoperatively, SNs are detected using a combination of a gamma probe/portable gamma camera, fluorescence imaging and blue dye detection (D). SN = sentinel node; γ = gamma radiation; λex = excitation wavelength of ICG; λem = emission wavelength of ICG. 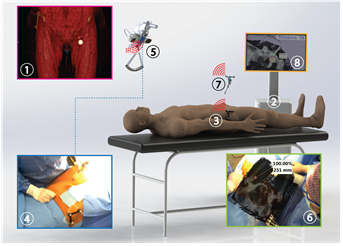 Intraoperative laparoscopic fluorescence guidance to the sentinel lymph node in prostate cancer patients: clinical proof of concept of an integrated functional imaging approach using a multimodal tracer. van der Poel HG, Buckle T, Brouwer OR, Valdés Olmos RA, van Leeuwen FW. Eur Urol. 2011 Oct;60(4):826-33. Optimisation of fluorescence guidance during robot-assisted laparoscopic sentinel node biopsy for prostate cancer. KleinJan GH, van den Berg NS, Brouwer OR, de Jong J, Acar C, Wit EM, Vegt E, van der Noort V, Valdés Olmos RA, van Leeuwen FW, van der Poel HG. Eur Urol. 2014 Dec;66(6):991-8. A hybrid radioactive and fluorescent tracer for sentinel node biopsy in penile carcinoma as a potential replacement for blue dye. Brouwer OR, van den Berg NS, Mathéron HM, van der Poel HG, van Rhijn BW, Bex A, van Tinteren H, Valdés Olmos RA, van Leeuwen FW, Horenblas S. Eur Urol. 2014 Mar;65(3):600-9. Luminescence-based Imaging Approaches in the Field of Interventional Molecular Imaging. Van Leeuwen FW, Hardwick JC, van Erkel AR. Radiology. 2015 Jul;276(1):12-29. Multimodal Surgical Guidance during Sentinel Node Biopsy for Melanoma: Combined Gamma Tracing and Fluorescence Imaging of the Sentinel Node through Use of the Hybrid Tracer Indocyanine Green-(99m)Tc-Nanocolloid. van den Berg NS, Brouwer OR, Schaafsma BE, Mathéron HM, Klop WM, Balm AJ, van Tinteren H, Nieweg OE, van Leeuwen FW, Valdés Olmos RA. Radiology. 2015 May;275(2):521-9. While sentinel node biopsy is a routine clinical indication that can benefit from image-guided surgery approaches, it seems imperative that the same technologies should also become available for the visualization of primary tumors and metastases. Here, fluorescence imaging in particular can be used to intraoperatively define margins. We have numerous projects running on the development and application of tumor receptor targeted hybrid tracers. Herein we pursue a number of targets using a combination of peptides, nanobodies and antibodies. Examples are the chemokine receptor 4 (CXCR4), Alpha-v beta-3 integrin (αVβ3), the human epidermal growth factor 2 (HER2), the prostate specific membrane antigen (PSMA), the somatostatin receptor 2, and hepatocyte growth factor receptor (HGFR or c-Met). While most our studies on this topic revolve around the chemical optimization of tracer design and preclinical evaluation, a c-Met tracer was already translated to the clinic and evaluated in a clinical trial. c-Met targeted fluorescence imaging. A) A fluorescently labeled c-Met targeting peptide showed differences in staining of healthy and tumor tissue during in vivo colonoscopy in patients. B) Ex vivo evaluation of the excised tissue samples showed corresponding staining with an anti-c-Met antibody (green) and the Cy5-labeled peptide (red). The image on the right shows the overlay staining of the antibody and the peptide. Imaging agents for the chemokine receptor 4 (CXCR4). Kuil J, Buckle T, van Leeuwen FW. Chem Soc Rev. 2012 Aug 7;41(15):5239-61. Detection of colorectal polyps in humans using an intravenously administered fluorescent peptide targeted against c-Met. Burggraaf J, Kamerling IM, Gordon PB, Schrier L, de Kam ML, Kales AJ, Bendiksen R, Indrevoll B, Bjerke RM, Moestue SA, Yazdanfar S, Langers AM, Swaerd-Nordmo M, Torheim G, Warren MV, Morreau H, Voorneveld PW, Buckle T, van Leeuwen FW, Ødegårdstuen LI, Dalsgaard GT, Healey A, Hardwick JC. Nat Med. 2015 Aug;21(8):955-61. Tailoring Fluorescent Dyes To Optimize a Hybrid RGD-Tracer. Bunschoten A, van Willigen DM, Buckle T, van den Berg NS, Welling MM, Spa SJ, Wester HJ, van Leeuwen FWB. Bioconjug Chem. 2016 May 18;27(5):1253-8. Hybrid peptide dendrimers for imaging of chemokine receptor 4 (CXCR4) expression.Kuil J, Buckle T, Oldenburg J, Yuan H, Borowsky AD, Josephson L, van Leeuwen FW. Mol Pharm. 2011 Dec 5;8(6):2444-53. Use of a single hybrid imaging agent for integration of target validation with in vivo and ex vivo imaging of mouse tumor lesions resembling human DCIS.Buckle T, Kuil J, van den Berg NS, Bunschoten A, Lamb HJ, Yuan H, Josephson L, Jonkers J, Borowsky AD, van Leeuwen FW. PLoS One. 2013;8(1):e48324. Peripheral nerve injury presents a notable (surgical) complication and can be very debilitating for patients; =5% of patients that undergo surgery have post-surgical morbidity that can be related to intraoperatively induced peripheral nerve injury. Societal/patient benefits related to technologies that enable peripheral nerve-preserving surgery may be found in factors such as: preservation of function, reduced surgical morbidity, and more rapid reintegration into society. Imaging technologies that enable surgeons to reduce intraoperative nerve injury, or even preserve specific nerve structures, may be seen as a true “game changer”. Here different routes can be pursued: 1) preoperative identification of nerves so that the chance of surgical side effects can be estimated, so-called virtual therapy, and 2) the development of fluorescent tracers specific for peripheral nerves. We explore both routes and have already performed first in-human studies evaluating the ability to perform nerve-specific imaging. Fluorescent lectins for local in vivo visualization of peripheral nerves. KleinJan GH, Buckle T, van Willigen DM, van Oosterom MN, Spa SJ, Kloosterboer HE, van Leeuwen FW. Molecules. 2014 Jul 8;19(7):9876-92. doi: 10.3390/molecules19079876. Diffusion-weighted-preparation (D-prep) MRI as a future extension of SPECT/CT based surgical planning for sentinel node procedures in the head and neck area? Buckle T, KleinJan GH, Engelen T, van den Berg NS, DeRuiter MC, van der Heide U, Valdes Olmos RA, Webb A, van Buchem MA, Balm AJ, van Leeuwen FWB. Oral Oncol. 2016 Sep;60:48-54. doi: 0.1016/j.oraloncology.2016.06.015. Improving the accuracy of interventional guidance relies only in-part on the tracers used. A high gain can also be obtained via the use of state-of-the-art hardware and software. A prime example herein is the impact that robot-assisted laparoscopic surgery has had on the field of urology. For this reason we, together with industrial partners, are also actively involved in the (re) engineering of both preclinical and clinical imaging modalities. Examples of our achievements in this area are: the refinement of intraoperative fluorescence cameras (both for open and laparoscopic surgery), the development of hybrid surgical guidance modalities, the development of virtual navigation approaches and the development of specialist modalities for (robot assisted) laparoscopic surgery. These developments are not limited to nuclear medicine and fluorescence, but also expand into the use of radiological modalities such as ultrasound, CT and MRI. Importantly we evaluate these new developments in phantom studies and clinical trials. The next evolution in radioguided surgery: breast cancer related sentinel node localization using a freehandSPECT-mobile gamma camera combination. Engelen T, Winkel BM, Rietbergen DD, KleinJan GH, Vidal-Sicart S, Olmos RA, van den Berg NS, van Leeuwen FW. Am J Nucl Med Mol Imaging. 2015 Feb 15;5(3):233-45. Since the beginning of the last century antibiotics have been developed to treat bacterial infections, e.g. penicillin, quinolones and glycopeptides. Despite their success, bacterial infections are still a serious global healthcare problem. Herein is tuberculosis the most prominent example, causing an estimated 1.5 million deaths in 2009. As a group we are active in the development of chemical entities that specifically adhere to (therapy-resistant) bacteria. When labeled with a radioisotope, a fluorescence label, or a combination of both, these chemical entities can be used in molecular imaging applications. Our group reported on the use of radiolabeled antimicrobial peptides for the imaging of bacterial infections for the first time in 1998. This concept was later confirmed in more than ten international clinical trials in collaboration with the IAEA. When the same chemical concepts are used to functionalize surfaces they can allow for selective binding of bacteria from aqueous (waste) solutions. Next to the specific targeting of infections we are using nanotechnology to target immune cells e.g. macrophages. This concept is already widely explored in our clinical trials that make use of the multimodal nanoparticle ICG-99mTc-nanocolloid. Next to imaging bacterial infections we also focus our efforts on other pathogens such as malaria parasites, in collaboration with Dr. Meta Roestenberg from the Clinical Parasitology group. Here we facilitate the development of fluorescent and radioactive tracers for malaria parasites. In order to get in depth insight into the kinetics of malaria infection and the transmission of parasites from the mosquito to the human host, we make images of the movement of parasites in ex vivo human skin and analyse their migratory behaviour. We can assess the effect of parasite attenuation, albeit chemical, radiation or genetical modifications on parasite movement and behaviour. We link our findings to the immunological signals obtained from skin tissue. 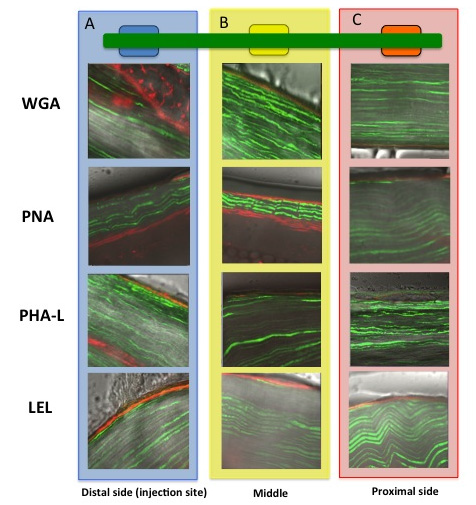 A) Pathways of bacterial targeting with imaging tracers, B) Bacterial specific imaging tracers can have their applications in locating and diagnosing local and hidden bacterial infections. Development of a Hybrid Tracer for SPECT and Optical Imaging of Bacterial Infections. Welling MM, Bunschoten A, Kuil J, Nelissen RG, Beekman FJ1,2, Buckle T, van Leeuwen FW. Bioconjug Chem. 2015 May 20;26(5):839-49. 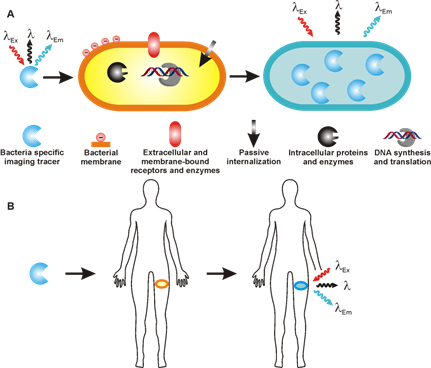 Development and prospects of dedicated tracers for the molecular imaging of bacterial infections. Bunschoten A, Welling MM, Termaat MF, Sathekge M, van Leeuwen FW. Bioconjug Chem. 2013 Dec 18;24(12):1971-89. Evaluation of 99mTc-UBI 29-41 scintigraphy for specific detection of experimental Staphylococcus aureus prosthetic joint infections. Sarda-Mantel L1, Saleh-Mghir A, Welling MM, Meulemans A, Vrigneaud JM, Raguin O, Hervatin F, Martet G, Chau F, Lebtahi R, Le Guludec D. Eur J Nucl Med Mol Imaging. 2007 Aug;34(8):1302-9. Epub 2007 Mar 3. Discovery and development of a synthetic peptide derived from lactoferrin for clinical use. Brouwer CP, Rahman M, Welling MM. Peptides. 2011 Sep;32(9):1953-63. Evaluation of 99mTc-UBI 29-41 scintigraphy for specific detection of experimental multidrug-resistant Staphylococcus aureus bacterial endocarditis. Brouwer CP, Gemmel FF, Welling MM. Q J Nucl Med Mol Imaging. 2010 Aug;54(4):442-50. As a result of the many new opportunities offered by nanotechnological approaches e.g. in diagnostics and therapy, this technology has aroused the interest of many biomedical research groups. Given the origin that we as a group have at the MESA+ Institute for nanotechnology we have been involved in this line of research since 2006. Although our efforts have mainly focused on the clinical translation and application of the multimodal (bio)nanoparticle ICG-99mTc-nanocolloid , we have ran and are running multiple projects wherein more experimental nanoparticles are used. Examples are quantum dots, silver/gold nanoparticles, and protein-based nanoparticles. In our research efforts in the area of bionanotechnology and nanomedicine we collaborate closely with the bionanotechnology (BioNT) research group at Wageningen University. Together this allows us to effectively combine fundamental supramolecular chemistry and nanotechnology-oriented research with the application in a biomedical setting. This combination of fundamental and applied science has in past already allowed us to translate a number of innovative concepts to the clinic. Topics range from dynamic supramolecular chemistry in solution and on surfaces, to biomedical use of nanomaterials (diagnostic and therapeutic), microfluidic technologies, functionalization of (stem)cells, and nuclear magnetic resonance imaging. Targeted non-covalent self-assembled nanoparticles based on human serum albumin. Bunschoten A, Buckle T, Kuil J, Luker GD, Luker KE, Nieweg OE, van Leeuwen FW. Biomaterials. 2012 Jan;33(3):867-75. Loading and release of fluorescent oligoarginine peptides into/from pH-responsive anionic supramolecular nanoparticles. Graña-Suárez L, Verboom W, Buckle T, Rood MT, van Leeuwen FWB, Huskens J. J Mater Chem B., 2016,4, 4025-4032. Enhanced luminescence of Ag nanoclusters via surface modification. Chin PT, van der Linden M, van Harten EJ, Barendregt A, Rood MT, Koster AJ, van Leeuwen FW, de Mello Donega C, Heck AJ, Meijerink A. Nanotechnology. 2013 Feb 22;24(7):075703. Orthogonal Functionalization of Ferritin via Supramolecular Re-Assembly. Spa SJ, Bunschoten A, Rood MT, Peters RJ, Koster AJ, van Leeuwen FW. Eur J Inorg Chem. 2015 Sep, 27, 4603–4610. Bunschoten A, Buckle T, Kuil J, Luker KE, Luker GD, Nieweg OE, van Leeuwen FWB. Targeted non-covalent self-assembled nanoparticles based on human serum albumin. Biomaterials. 2012:33:867-875.
van Leeuwen AC, Buckle T, Vermeeren L, Valdés Olmos RA, van der Poel HG, van Leeuwen FWB. “Cocktail” injections for combined pre- and intraoperative multimodal imaging of the tumor draining lymph nodes in a spontaneous mouse prostate tumor model. J Biomed Opt. 2011;16:016004. Buckle T, van Leeuwen AC, Chin PTK, Janssen H, Muller S, Jonkers J, van Leeuwen FWB. A self-assembled multimodal complex for combined pre- and intraoperative imaging of the sentinel lymph node. Nanotechnology. 2010;21:35101. KleinJan GH, Bunschoten A, van den Berg NS, Valdés-Olmos RA, Klop WMC, Horenblas S, van der Poel HG, Wester HJ, van Leeuwen FWB. Fluorescence guided surgery and tracer-dose, fact or fiction? Eur J Nucl Med Mol Imaging. 2016. DOI: 10.1007/s00259-016-3372-y. KleinJan GH, Brouwer OR, Mathéron HM, Rietbergen DDD, Valdés-Olmos RA, Wouters MW, van den Berg NS, van Leeuwen FWB. Hybrid radioguided occult lesion localization (hROLL) of 18F-FDG-avid metastases using the hybrid tracer indocyanine green-99mTc-nanocolloid. Rev Esp Nucl Med Mol Imagen. 2016. In press. van den Berg NS, KleinJan GH, Miwa M, Sato T, Maeda Y, van Akkooi ACJ, Horenblas S, Karakullukcu B, van Leeuwen FBW. (Near-infrared) fluorescence guided surgery under ambient light conditions, a next step to embedment of the technology in clinical routine. Ann Surg Oncol. 2016. DOI:10. 1245/ s10434-016-5186-3. van den Berg NS, Brouwer OR, Mathéron HM, Nieweg OE, Valdés Olmos RA, van Leeuwen FWB. Surgical navigation towards the sentinel node in patients with melanoma: a pilot study on expanding the intraoperative use of preoperative SPECT/CT images. Nucl Med Comm. 2016. In press. Multimodal surgical guidance during sentinel node biopsy for melanoma: Combined gamma tracing and fluorescence imaging of the sentinel node through use of the hybrid tracer indocyanine green-technetium-99m-nanocolloid. Radiology. 2015:275(2);530-537. Borbón-Arce M, Brouwer OR, van den Berg NS, Mathéron H, Klop WMC, Balm AJM, van Leeuwen FWB and Valdés-Olmos RA. An innovative multimodality approach for sentinel node mapping and biopsy in head and neck malignancies. Rev Esp Med Nucl Imagen Mol. 2014:33(5):274-9.
van den Berg NS*, Brouwer OR*, Klop WMC, Karkullukcu B, Zuur CL, Tan BI, Balm AJM, van den Brekel MWM, Valdés Olmos RA, van Leeuwen FWB. Concomitant radio- and fluorescence-guided sentinel lymph node biopsy in squamous cell carcinoma of the oral cavity using ICG-99mTc-nanocolloid. Eur J Nucl Med Mol Imaging. 2012;39(7):1128-36. Frontado ML, Brouwer OR, van den Berg NS, Mathéron HM, Vidal-Sicart S, van Leeuwen FW, Valdés Olmos RA. Added value of the hybrid tracer indocyanine green-99mTc-nanocolloid for sentinel node patients in a series of patients with different lymphatic drainage patterns. Rev Esp Med Nucl Imagen Mol. 2013;32(4):227-33. Brouwer OR, Buckle T, Vermeeren L, Klop WMC, Balm AJM, van der Poel HG, van Rhijn BW, Horenblas S, Nieweg OE, van Leeuwen FWB, Valdes Olmos RA. Validation of a multimodal radioactive/fluorescence imaging agent for lymphatic mapping and simultaneous radioguided and optical sentinel node detection. J Nucl Med. 2012;53:1034-40. Brouwer OR, Buckle T, Vermeeren L, Klop WM, Balm AJ, van der Poel HG, van Rhijn BW, Horenblas S, Nieweg OE, van Leeuwen FW, Valdés Olmos RA. Comparing the hybrid fluorescent-radioactive tracer indocyanine green-99mTc-nanocolloid with 99mTc-nanocolloid for sentinel node identification: a validation study using lymphoscintigraphy and SPECT/CT. J Nucl Med. 2012 Jul;53(7):1034-40. Engelen T, Winkel, BMF, Rietbergen DDD, KleinJan GH, Vidal-Sicart S, Valdés Olmos RA, van den Berg NS, van Leeuwen FWB. The next evolution in radioguided surgery: Breast cancer related sentinel node localization using a freehandSPECT-mobile gamma camera combination. A J Nucl Med Mol Imaging. 2015; 5;5(3):233-45. Schaafsma BE, Verbeek FPR, Rietbergen DDD, van der Hiel B, van der Vorst JR, Tummers QRJG, Liefers G, Frangioni JV, van de Velde CJH, van Leeuwen FWB, Vahrmeijer AL. Combined Radio- and Fluorescence-guided Sentinel Lymph Node Biopsy in Breast Cancer. British J. Surg. 2013;100:1037-44. Engelen T, Winkel BMF, Rietbergen DDD, KleinJan GH, Vidal-Sicart S, Valdes Olmos RA, van den Berg NS, van Leeuwen FWB. The next evolution in radioguided surgery: Breast cancer related sentinel node localization using a freehandSPECT-mobile gamma camera combination. Am J Nucl Med Mol Imaging. 2015. In press. van den Berg NS, Brouwer OR, Schaafsma BE, Mathéron HM, Klop WMC, Balm AJM, van den Brekel MWM, van Tinteren H, Nieweg OE, van Leeuwen FWB, Valdés-Olmos RA. Multimodal surgical guidance during sentinel node biopsy for melanoma: Combined gamma tracing and fluorescence imaging of the sentinel node through use of the hybrid tracer indocyanine green-technetium-99m-nanocolloid. Radiology. 2015:275(2);530-537. Verbeek FP, Tummers QR, Rietbergen DD, Peters AA, Schaafsma BE, van de Velde CJ, Frangioni JV, van Leeuwen FW, Gaarenstroom KN, Vahrmeijer AL. Sentinel lymph node biopsy in vulvar cancer using combined radioactive and fluorescence guidance. Int J Gynecol Cancer. 2015;25(6):1086-1093. Mathéron HM*, van den Berg NS*, Brouwer OR, KleinJan GH, van Driel WJ, Trum JH, Vegt E Kenter G, van Leeuwen FWB, Valdés Olmos RA. Multimodal surgical guidance towards the sentinel node in vulvar cancer. Gynecol Oncol. 2013;131(3):720-5. Verbeek FP, Tummers QRJG, Rietbergen DDD, Peters AAW, Schaafsma BE, van de Velde CJH, Frangioni JV, van Leeuwen FWB, Gaarenstroom KN, Vahrmeijer. Near-infrared fluorescence sentinel lymph node biopsy in vulvar cancer: a comparison of lymphatic tracers. Int J Gyneacol Cancer. 2015. In press. van den Berg NS, Buckle T, KleinJan GH, van der Poel HG, van Leeuwen FWB. Multispectral fluorescence imaging during robot-assisted laparoscopic sentinel node biopsy, a first step towards a fluorescence-based anatomical roadmap. Eur Urol 2016. In press. KleinJan GH, van den Berg NS, van Oosterom MN, Wendler T, Miwa M, Bex A, Hendricksen K, Horenblas S, van Leeuwen FWB. Towards (hybrid) navigation of a fluorescence camera in an open surgery setting. J Nucl Med. 2016. Accepted for publication. KleinJan GH, van den Berg NS, de Jong J, Wit EM, Thygessen H, Vegt E, van der Poel HG, van Leeuwen FWB. Multimodal hybrid imaging agents for sentinel node mapping as a means to (re)connect nuclear medicine to advances made in robot-assisted surgery. Eur J Nucl Med Mol Imaging. 2016. DOI: 10.1007/s00259-015-3292-2. van Oosterom MN, Simon H, Welling MM, Mengus L, van der Poel HG, van den Berg NS, van Leeuwen FWB. Revolutionizing (robot-assisted) laparoscopic gamma tracing using a drop-in gamma probe technology. AJNMMI. 2016;6(1):1-17.
van den Berg NS, Simon H, KleinJan GH, Engelen T, Bunschoten A, Welling MN, Tijink BM, Horenblas S, Chambron J, van Leeuwen FWB. First-in-human evaluation of a hybrid modality that allows combined radio- and (near-infrared) fluorescence tracing during surgery. Eur J Nucl Med Mol Imaging. 2015; 2(11):1639-47. Kleinjan GH*, van den Berg NS*, Brouwer OR, de Jong J, Acar C, Wit EM, Vegt E, van der Noort V, Valdés Olmos RA, van Leeuwen FW, van der Poel HG. Optimisation of fluorescence guidance during robot-assisted laparoscopic sentinel node biopsy for prostate cancer. Eur Urol. 2014:66(6);991-8. (Highlighted in Nature Reviews Urology, 2014. DOI: 10.1038/nrurol.2014.217). Brouwer OR*, van den Berg NS*, Mathéron HM, van der Poel HG, van Rhijn BW, Bex A, Valdés-Olmos RA, van Leeuwen FWB, Horenblas S. A hybrid radioactive and fluorescent tracer for sentinel node biopsy in penile carcinoma as a potential replacement for blue dye. Eur Urol. 2014;65:600-609. (Highlighted in Nature Reviews Urology, 2014, 11, 135-137). Brouwer OR, van den Berg NS, Mathéron HM, Nieweg OE, Horenblas S, van der Poel HG, Valdés-Olmos, van Leeuwen FWB. Feasibility of intraoperative navigation to the sentinel node in the groin using preoperatively acquired single photon emission computed tomography data: Transferring functional imaging to the operating room. J Urol. 2014:192(6);1810-6. Brouwer OR, Buckle T, Bunschoten A, Kuil J, Wendler T, Vahrmeijer AL, Valdes Olmos RA, van der Poel HG, van Leeuwen FWB. Image navigation as a means to improve the accuracy of fluorescence guided surgery: fine tuning (hybrid) image guided surgery. Phys Med Biol. 2012;57:3123-36. Buckle T, Brouwer OR, Valdés Olmos RA, van der Poel HG, van Leeuwen FWB. Relation between intraprostatic tracer deposits and sentinel lymph node mapping in prostate cancer patients. J Nucl Med. 2012;53:1026-33.
van der Poel HG, Buckle T, Brouwer OR, Valdés Olmos RA, van Leeuwen FWB. Intraoperative laparoscopic fluorescence guidance to the sentinel lymph node in prostate cancer patients; clinical proof of concept of an integrated functional imaging approach using a mulitmodal tracer. Eur Urol. 2011;60:826-33.
van Leeuwen FWB, Hardwick JCH, van Erkel AE. “Luminescence-based imaging approaches in the field of interventional (molecular) imaging”. Radiology. 2015. In press. Engelen T, KleinJan GH, van Leeuwen FWB, van den Berg NS. “Virtual-reality in de operatiekamer: Kan intra-operatieve navigatie op basis van preoperatieve (nucleaire) beeldvorming worden gebruikt om de chirurgische opsporing van laesies te verbeteren?”. Medisch Contact. 2015. Accepted for publication. Valdes Olmos RA, Vidal-Sicart S, Giammarile G, Zaknum JJ, van Leeuwen FWB, Mariani G. “The GOSST concept and hybrid mixed/virtual/augmented reality environment radioguided surgery”. Q J Nucl Med Mol Imaging. 2014; 58(2):207-15.
van Leeuwen FWB. Hybride tracers voor beeldgeleide chirurgie. Kanker Breed. 2014. Spring issue. Greco F, Cadeddu J, Gill I, Kaouk J, Remzi M, Thompson H, van Leeuwen FWB, van der Poel HG, Fornara P, Rassweiler J. Current perspectives in the use of molecular imaging to target surgical treatment of genitourinary cancers. Eur Urol. 2013;65:947-964.
van den Berg NS, Buckle T, KleinJan GH, Klop WMC, Horenblas S, van der Poel HG, Valdés Olmos RA, van Leeuwen FWB. Hybrid tracers for sentinel node biopsy. Q J Nucl Med Mol Imaging. 2014;58(2):193-206. Winkel BMF, Kuil J, Rietbergen DDD, Valdes-Olmos RA, van Leeuwen FWB. Clinical value of hybrid imaging agents”. Nederlands Tijdschrift voor Nucleaire Geneeskunde. 2013;35:1173-1183. Chin PTK, Welling MM, Meskers SCJ, Valdes Olmos RA, Tanke H, van Leeuwen FWB. Optical imaging as an expansion of nuclear medicine: Hybrid imaging agents vs. Cerenkov luminescence imaging. Eur J Nucl Med Mol Imaging 2013;40:1283-91. KleinJan GH, Bunschoten A, Brouwer OR, van den Berg NS, Valdés-Olmos RA, van Leeuwen FWB. Multimodal imaging in radioguided surgery. Clinical and Translational Imaging. 2013;1:433-444.
van den Berg NS, Valdés-Olmos RA, van der Poel HG, van Leeuwen FW. Sentinel lymph node biopsy for prostate cancer: A hybrid approach. J Nucl Med. 2013;54(4):493-6.
van den Berg NS, van Leeuwen FWB, van der Poel HG. ”Fluorescence guidance in urologic surgery”. Curr Opin Urol. 2012;22:109-120. Brouwer OR, van Leeuwen FWB, Meinhardt W, Valdes Olmos RA, van der Poel HG. De schildwachtklierprocedure bij prostaatkanker: huidige ervaring en nieuwe ontwikkelingen. Nederlands tijdschrift voor Urologie. 2012;4:84-91. Buckle T, Chin PTK, van Leeuwen FWB. (Non-targeted) nanosized radioactive/fluorescent imaging agents for combined pre- and intraoperative imaging of the lymphatic system. Nanotechnology. 2010; 21:482001-28. Vidal-Sicart S, van Leeuwen FWB, van den Berg NS, Valdés Olmos RA. Fluorescent radiocolloids, are hybrid tracers the future for lymphatic mapping?. Eur J Nucl Med Mol Imaging. 2015. DOI:10.1007/s00259-015-3132-4 (editiorial). Engelen T, KleinJan GH, van Leeuwen FWB, van den Berg NS. Virtual-reality in de operatiekamer: Kan intra-operatieve navigatie op basis van preoperatieve (nucleaire) beeldvorming worden gebruikt om de chirurgische opsporing van laesies te verbeteren?. Medisch Contact. 2015.
van Leeuwen FWB, de Jong M. “Role of optical imaging in nuclear medicine”. European J Nucl Med Mol Imaging 2014; 41:2150-3 (editorial). van Leeuwen FWB, Hruby S. “Fluorescence guidance during radical prostatectomy”. Eur Urol. 2014. S0302-2838(13)01460-7 (editorial). van der Poel HG, van den Berg NS, KleinJan GH, van Leeuwen FWB. “Removing nodes that count rather than counting nodes that don’t. Reply from authors to: Francesco Montorsi, Giorgio Gandaglia. Sentinel node biopsy for prostate cancer: A useless surgical exercise?” Eur Urol 2014;66:999-1000.
van Leeuwen FWB, van den Berg NS, van der Poel HG. “Fluorescence applications in robotic surgery”. Eur Urol Today. February/March 2014 (editorial). van der Poel HG, Brouwer OR, van den Berg NS, Buckle T, van Leeuwen FW. ”Reply to K. Polom, D. Murawa, W. Polom's Letter to the Editor re: Henk G. van der Poel, Tessa Buckle, Oscar R. Brouwer, Renato A. Valdés Olmos, Fijs W.B. van Leeuwen. Intraoperative laparoscopic fluorescence guidance to the sentinel lymph node in prostate cancer patients: Clinical proof of concept of an integrated functional imaging approach using a multimodal tracer”. Eur Urol. 2011;60:826-33. Christensen A, Juhl K, Charabi B, Mortensen J, Kiss K, Kjær A, von Buchwald C. Feasibility of real-time near-infrared fluorescence tracer imaging in sentinel node biopsy for oral cavity cancer patients. Ann Surg Oncol. 2016;23(2):565-72. Stoffels I, Leyh J, Pöppel T, Schadendorf D, Klode J. Evaluation of a radioactive and fluroescent hybrid tracer for sentinel lymph node biopsy in head and neck malignancies: prospective randomized clinical trial to compare ICG-(99m)Tc-nanocolloid hybrid tracer versus (99m)Tc-nanocolloid. Eur J Nucl Med Mol Imaging. 2015;42(11):1631-8.